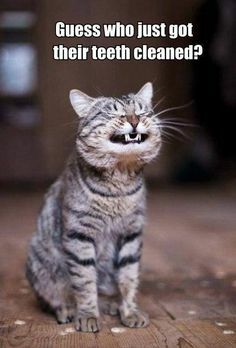 ﻿﻿Regular professional dental cleaning is important to maintain your pet's teeth. We use modern and safe ultrasound technology to clean each tooth thoroughly - above and below the gum line. We then polish the teeth to create a smooth, lustrous tooth surface that is more resistant to plaque buildup. When dental calculus (tartar) forms on your pet's teeth it is composed of various mineral salts, bacteria, organic material and food particles. In the early stages of accumulation, the material is soft (plaque), but it later hardens and adheres to the teeth. Continual accumulation causes inflammation of the gums and eventual recession of the gums and loose teeth. Animals get periodontal disease, gingivitis and tooth decay just like humans. The breath becomes very odorous and the mouth becomes a dangerous source of infection. As most of us know, the gums and teeth can be very painful. What you don't see is the untreated tooth and gum disease allowing bacteria to enter the bloodstream and causing not only infections but also eventually damage to the valves of the heart, kidneys and the liver. Regular dental check ups, cleaning and brushing at home can add years to your pet's life and prevent many disease processes. Churchville Veterinary Hospital offers a wide variety of products and services to keep your pet's mouth (and body) healthy. For more details about Oravet please review the study information by clicking below.